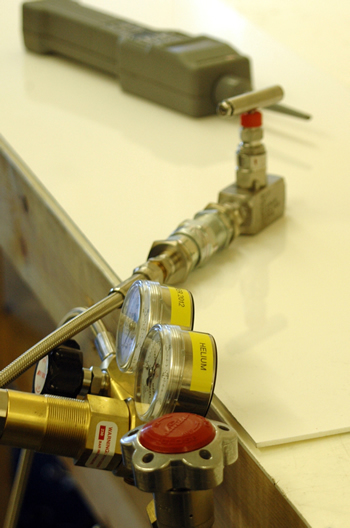 To complement our existing testing services, Buckley Industrial has the facilities in order to perform helium testing. Due to its small molecular size, it is very searching enabling it to penetrate tiny holes that other testing fluids may not be able to. The component is filled with helium and pressurised to the desired pressure rating, usually determined by the customer, and held for approximately 1 minute. After the hold test has been completed a leak test should be carried out on all joints and welds using a Calibrated Gascheck G3 helium leak detector. Helium with different levels of purity, up to 99.99999% pure helium (N7.0), is available depending on customer requirements. We always perform helium testing in a clean environment, however, upon request it can be carried out in an ISO 14644 Class 5 clean room. For further information please contact our sales team.